is a tool that easily confronts with all the neccessary letter or glyph pairs your font provides. Since it reads your character set, it doesn’t matter how many or few glyphs you got. You’ll see all possible combinations. You can filter to exclude already kerned pairs, or kerning groups. You can split the output into categories like [Letter], [Number], [Symbol], [Punctuation]. Each glyph you worked on will write it’s name into an checklist, so you will always keep track of your progress. with this you can interpolate the kerning between your masters (given it has got at least 2 of them). It uses the weight value to calculate. 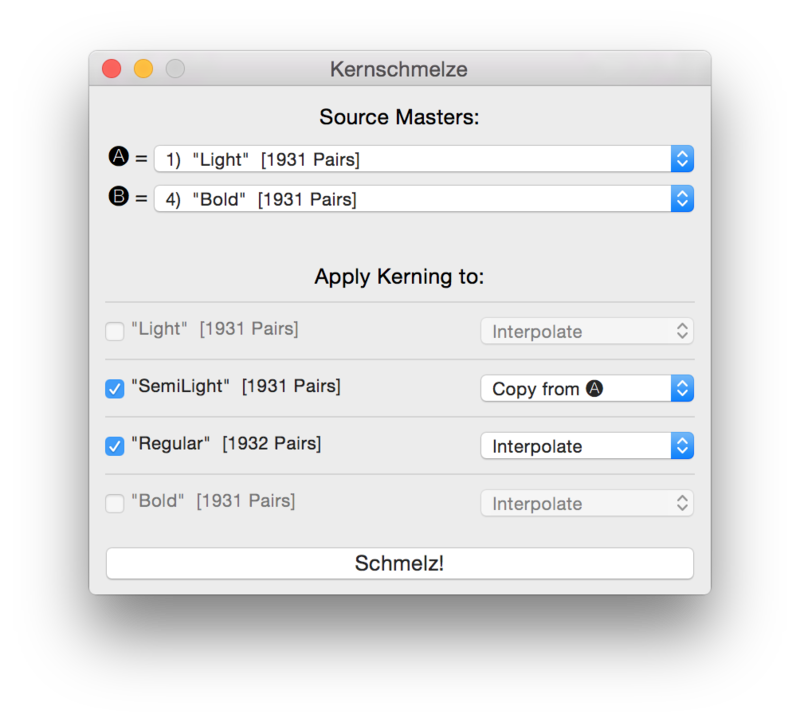 You can choose the source and target masters and wheter you want to interpolate or copy the kerning.